Migration poses many challenges for children and their families: the factors, such as poverty and violence which cause migrants to leave their country of origin, and the isolation and fear faced upon arrival in the host country. Many children arrive in new countries alone, unaccompanied and undocumented, making them vulnerable to violence, exploitation and other violations of their rights. Children in these precarious situations may be detained arbitrarily, denied their right to education or subjected to abuse. DCI national sections, particularly in the European region, work closely with migrants and asylum seeking children to ensure that their rights are respected and protected. 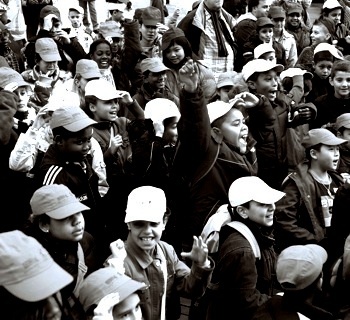 DCI-Belgium organised a public “Opinion Tribunal” with the aim of denouncing the Belgian State’s arbitrary detention of migrant and asylum seeking children. A mock tribunal was held with a youth jury and child rights expert jury who reviewed the cases and delivered judgements. DCI-Netherlands launched a campaign “No child is illegal” to assist the more than 30000 children living undocumented in the Netherlands. The campaign included the development of an accessible resource website for young people on the laws affecting them and their rights. On the anniversary of Universal Children’s Day, pedagogical activities for direct participation by children were organised at various places simultaneously. One of them was a giant labyrinth erected in the centre of Rotterdam to symbolise young people’s confusion and difficulty in navigating the maze of rights and obligations. Children answered questions on child rights to find their way out.